Two years ago today Hoe and Shovel was launched as a way for me to “talk” about my love for gardening. Soooo… in honor of this Happy Blogiversary I’ve poked around in the archives a little bit to help us reminisce from whence we began our blogging life ... in June 2007. Seeing these photos reminds me how we've gradually removed more and more of the lawn grass to make way for more and sometimes just bigger planting beds. My super-creative, smart, and talented daughter is the one who actually pushed me off the diving board with the idea to blog. Always my biggest cheerleader for every endeavor I’ve undertaken, she came up with the plan to start a blog for me. I chuckled at the thought at first. Said I didn’t have time to blog. HA! I still don’t have time to blog but somehow I make time for it. I have to admit, blogging has been an experience that I never (not in a thousand years) would have thought I would like. It has turned out quite differently than that first thought. Humoring my good friend and sweet daughter I gave her the go ahead to set up my Blogger template. She is the one who came up with using the pseudo-name Meems. I’m not so keen on sharing with the entire Internet world my given name. Meems is actually a nickname my grandkiddos – and now kiddos and spouses of kiddos – call me on occasion. We do that in our family… start with one name and end up with several. In case you don’t know already, Meems is an adaptation of my grandma name, Mimi. And now you know me as Meems, too. As far as the name Hoe and Shovel. Well, that's been discussed thoroughly already and you can read about that here if you’d like. My first post ever was June 16, 2007. For some reason (probably because I didn’t know how) I didn’t even upload a photo. My daughter was the only anonymous commenter. I had no idea there were other garden blogs when I first began. NO idea I’m telling you. It took a couple of months before it was realized there actually were garden blogs all over America and the world, too. Not too many in Florida at the time, however. Anyway, blogging has been an eye-opening experience to say the least. I’ve learned so much from my blogging friends. You have encouraged me to try new plants and new methods and inspired me to take risks. Your knowledge has sparked my interest in Native plants, bulbs, seeds, cuttings, and bare root possibilities. With so much help and excellent support at my fingertips it was blogging that first and foremost gave me the courage to start a vegetable garden last year. A desire I’d had for many years but just hadn’t taken the plunge until spring of 2008. Blogging has been a wonderfully creative outlet for me to play with photographing the garden and all the creatures that live there. Being behind a lens and capturing what you want a photo to “say” is one of those things that I didn’t realize how much I loved until I started blogging. Gardening is such an integral part of what moves me. I will always go to the garden with my heart open wide to possibilities and potential. There are daily lessons to be learned, sounds of life to cheer my soul, peace to center my being, smells to delight my senses, designs to lure my creativity, and the thrill of soil for my hands to work. To each and every one that has traveled along this blogging/gardening journey with me it has been my privilege. Whether you are a new reader or a long-time loyal reader… just the fact that you take your time to come here is appreciated more than you can know. Your input and your friendship (some of you off-blog…some of you face to face) has been so very enriching. Thank you! Oh what a great blog! Happy blogiversary to you and your garden Meems. Wishing you many more to come from my garden to yours. Am really happy to know you, your garden and the beautiful state of Florida through your eyes. A job well done! Wonderful and congrats.... but even your befores are stunning! What a great ride you have given us thus far. Going to Yosemite today for a week have fun. I just past my 1 year and completely missed it. So much fun to see what you have done in the two years.....also how the garden transforms itself based on your guidance...congrats! Happy 2nd anniversary, Meems. It sure has been fun following your blog and visiting your beautiful state to see the flora firsthand. I love forward to many more wonderful and informative posts. 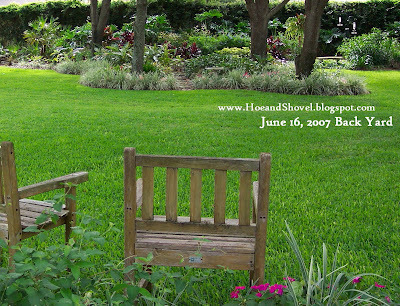 Happy Blogiversary!I have really enjoyed reading about your garden. You know how much I love reading about your garden and seeing your beautiful garden photos. Your talents are inspirational to us. I can only dream of growing a few of your plants in pots, not the garden, up here, but I get a thrill with every story you post. Happy Blogiversary. Great trip through time and the garden. What a beautiful garden. Happy blog anniversary, Meems! I loved this post, especially this quote "always go to the garden with my heart open wide to possibilities and potential." That's poetry and sage advice to all of us. Us Type A gardeners need to stop looking at the garden as a list of things to do and start seeing possibilities. Thank you for what I learn from you, and here's to many more years of Hoe and Shovel. Meems - Happy Blogiversary! 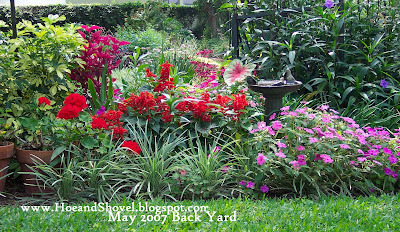 You have a stunningly beautiful garden and it was so fun to see the before and after pictures of previous years. You should be so proud of your garden and your blog. Of all the gardens, yours rates right up there as one of my favorites. Keep up the good work. Congratulations on your wonderful blog. I have been a spectator for about a year and check your blog every morning. I've especially enjoyed it through our long winter where I would enlarge your photos and thoroughly enjoy the detail. Meems, thank you for taking the time to share your lovely garden with the world. It's appreciated more than you'll ever know. Congratulations on your blogaversary, Meems! I agree that blogging has been such a great experience; I've learned so much from other bloggers, but most of all I value the friendships I've made here. I love the before and after photos. Your garden was beautiful before, but it's even lusher and fuller now. 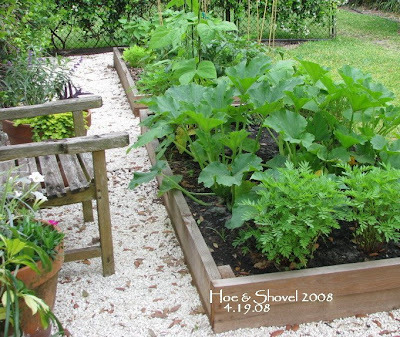 I didn't realize this is only your second year of vegetable gardening--your veggie beds certainly look like the work of a pro! Congrats! Yes your gardens have expanded only to had more beauty to your eyes and ours if only through photos! Great Post!! What a wonderful two year Blogiversary post! Congrats to you! Blogging is so time consuming but so rewarding at the same time. A funny thing. Your garden is so spectacular and it looks like it hasn't changed much (a good thing I think) except for the veggie garden. Wonderful! Congrats to you again Meems! And here's to many many more! I am sure I speak for so many when I say "Meems, the pleasure is all ours." On your second blog anniversary, I will just say it again. You inspire me. Wow, time really does fly. I'll have to check and see how long I've been at it. I've very much enjoyed seeing and reading about your garden endeavors. Thank you (and your daughter) for stepping out and sharing your garden with all of us. It's fun to read and see the many ways we can successfully garden in Florida. You make it looks so easy. I love the idea that you are gradually making your grass disappear. That's exactly what I would eventually like to do with my yard. But to see the progression in pictures is interesting. Thanks for that too. Happy Blogiversary! Thank you for your posts and advice!! I'm so glad you think so... YOU are one of those I am grateful to have met off blog! How wonderful it is that I have met you and we have broken bread together! You are a delight and a joy... Thank you! Hello and thanks for dropping by. Every season I dig up more of that grass for plants. So many changes that don't really show up in the long range views. Thank you! Come back with some great photos... I know you will. I forgot about my one year too... but thought I'd give myself a little celebration for the two year. The garden is an ever-changing progression. It is the one of the things I love about it... I can change it on a whim. I'm so happy you've come along on the journey with me. The next time you get down this way we will definitely have to make sure we meet. Thank you. I'm glad you enjoy it. Now you have to come see it. You are so sweet to say so. You know I absolutely adore your creativity and your beautiful gardens. Most of which I cannot grow here but it sure is fun to see the differences. Thank you and I appreciate your visits! Hello and welcome... thanks for your comments and I hope you come back. Thank you and I'm so happy you stopped by today. I just love those words "Instrument of Grace." Believe me, I know what it's like to be a type A personality. But being in the garden helps me temper the overdrive. I'm learning to be more patient about the garden and to appreciate every tiny thing. I'm very thankful you read along with me. Thank you. You are so kind to say such things. I DO love my garden but you know how that is... so many visions yet to be completed. Hey... coming from Mother Nature that's a HUGE compliment. :-)Thank you. I'm so glad to know you have been reading along with me. And thank you for taking a moment to comment today. Being able to garden all year long is something I'm so thrilled over.It is lots of hard work but I can't imagine being without greenery for any part of the year. I love Florida and I'm happy you have enjoyed it with me. Blogging about gardens just brings out the nicest people. I have to confess the veggie garden has kicked up my gardening time a few levels... and it's not as if I didn't already spend loads of time in the garden. But the level of satisfaction is brings is unmistakably worth it. The first season I really stressed over it. It felt as if I had two separate gardens. One for the veggies and one for the landscape. Once I looked at it as part of the overall garden - it seemed to be a lot easier - even though it's bigger. Well, it's not all beautiful but we'll keep working on it. thank you! My garden has the same good bones we started with but so many new beds and plants and variety than when I started blogging. Thanks for coming by today and for the good wishes. Thank you. You have a big challenge coming from the north and learning how to grow in Florida. I'm so glad to be even a little part of the solution for you... and happy to get to know a fellow Florida gardener. You are doing a great job! You were one of the first people who made me aware there were other gardening blogs out there. Who knew how it would explode right after that? I'd love to know how long you've been at this... long before so many of us. Did you see the Lotus in my header? You need to start a blog! Thank you for your kind comments. I'm leaving enough grass in the back yard to play games at holidays and so the grandkiddos can run around and swing bats and golf clubs and such. Although they running through the pathways in the landscape, too. But I'll keep inching my way through that grass because the ideas just keep coming and I can't seem to help myself! I'm still hoping I'll get to truly warmly welcome you to my garden some day. I remember so well when you started visiting... it was like having an old friend here. Thank you for being one of the dear faithfuls. Hugs. I'm pretty sure you know a whole lot more than I do. I always learn something when I visit your blog. Thanks for stopping by today... and happy gardening down there in beautiful south Florida. Happy Blogiversary! I always enjoy your blog and beautiful pictures. Blogging is a lot different than I expected too. It's a great way to get "know" other gardeners around the world. Hi Meems! I want to add my happy blogaversary wishes to you too. I think your blog is outstanding even tho I don't get to visit as often as I'd like. It's always uplifting to me during the long cold winter months. I click on your link and suddenly, it's summer. 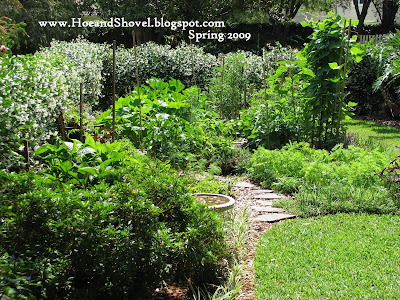 It looks like both your gardens and you (the gardener) have grown & evolved during this two year time period. I just started my first veggie plot this year ~ maybe blogging is the common influencer?? Anyway, I'm glad your daughter encouraged you and I hope you continue to blog for a long time. Your garden gets bigger and lovelier every year. Imagine what it will look like when you celebrate your 10th Blogaversary. Wow!!! Meems~~ Your gardens are fabulous--one of the few things in this life that actually improve with age. Congrats on your two-year! Gardeners are really the best. Having the earth and the love of life in common is a wonderful bond. A big thank you for visiting today. Even though we garden in very different climates I always enjoy going to your blog to see what's happening. YOU are a wonderfully creative gardener. I always appreciate your visits and I love going to your blog when I get a chance. Congrats on your first veggie garden and congrats on making so many tropicals work for you in your climate. So sorry to burst your bubble... but you can call me Meems because so many people do anyway... it's very much a second name for me now. Ten years seems so far away and yet it will be here before you know... so I always say... you might at well be growing something! Thank you for the congrats... I hear you about the age thing. HA! Thank you also for joining the blogging community with your beautiful plot of earth and your sweet personality. So fun getting you know you. Happy blogaversary, one day late! How funny that your daughter started the blog for you. You've made it a joy and pleasure to visit, especially in the winter, when we Northerners are starved for color and blooms. Congrats! I loved seeing the pictures of the past and present. 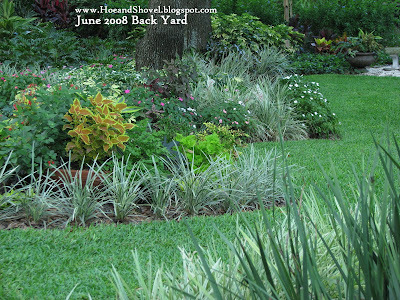 I really liked the one with the Caldiums and Grass that was the border and how it is now the center of the bed. 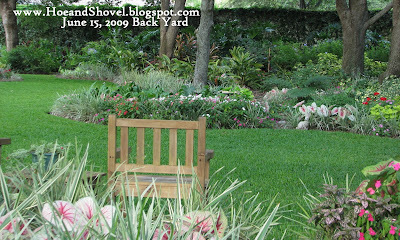 how nice to reminisce about gardening and blogging. happy "2" blogiversary. being in the garden is fantastic, but being able to share it is equally fantastic. thanks to arissa-mae for starting you on this wonderful journey of journaling your wonderful, lush florida garden. it is so very cool seeing the progression in your tropical landscape and also your developing love for photography...both of which you are so proficient. and a big thanks to all of you bloggers in florida for giving me the courage to start. we have got to try to find some pictures of the year i got married...what the garden looked like. i thought it was the most beautiful thing ever and now look at it...it is more than amazing. Meems, I am so glad that you decided to blog. 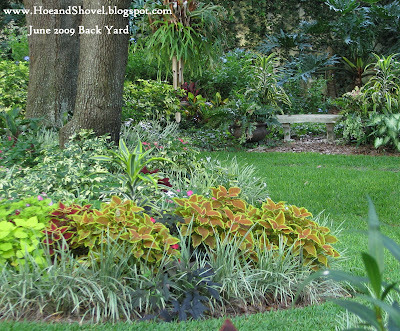 I so enjoy your garden through your blog. It certainly has been fun watching the lawn disappear and the veggie garden grow. I hope you have many more years of blogging and gardening. Meems, you beautifully put into words many of my feelings about blogging, too. I'm so grateful to have learned so much from others. I really don't have as much time to blog as I would like. I've noticed that many of my favorite - and most active - garden bloggers are in a different stage of life than me. That's OK - at least I can keep a toe in for a few decades until I'm a grandma with my laptop on the lazy-boy and my kiddos more independent than they are now! Though I'm loving this stage of life, don't get me wrong. happy 2nd blogiversary honey! it seems superfluous to add a comment to the many kudos already posted, but here goes. i've asked you before "do you blog to motivate your gardening or do you garden to inspire your blog?" i guess it is really a little of both, isn't it? i feel especially blessed that i can not only enjoy your blog every day, but occasionally have the privilege to stroll thru the garden and see first-hand the results of your hard work. and as i've also mentioned to you, your photos are worthy of awards. your blog provides beauty, insight, information and encouragement to so many of us mini-gardeners out here in blogosphere. now i want to tell a secret to your blog friends. 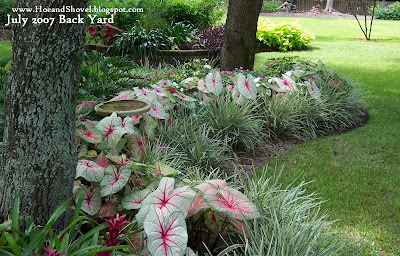 i don't think you have ever posted on this, but the top pic in your sidebar of the caladiums and bird bath is actually the first painting you ever did. i just have to brag on your many faceted talents, cause that is what moms are prone to do! and i am so proud of you! happy gardening! Thank you for the congrats. My daughter (an adult) had a couple of blogs of her own already set up so she thought it a good idea to get me started on one ... thus all the cheerleading for mine. It was a fun thing for us to do together. So glad you enjoy coming here especially for snow-relief. You are observant. Thank you. I didn't think I captured that expansion too well. It is very wide there but you get the idea. The first set of photos shows it looking straight on. Before and afters are always fun to see I think. That would be really fun. I can remember so clearly working so hard to get everything in order for that outdoor occasion. That was before the trees in the back were planted... can you believe it? Now that I think about it... the summer rains came early that year too. HA! Don't you wonder sometimes how long can you keep talking about the same garden? And yet just like gardening there comes a new inspiration and away we go for another post! Thank you for being a faithful reader and commenter... someday you're going to get down to see your family in St. Pete and we will meet... here! Ahhhh... the stages of life. Each one to be fully embraced. YOU are in the stage of laying it down for your little ones. I'm amazed that any young mom has time at all to blog so you are doing great. There will be time later for you... believe me. Even though it doesn't seem that way now it will come before you know it. I admire you for finding the balance in life for all you do. Keep up the good work. Probably a little of both. Inspiration is just that... it comes from the inside. It's all your fault anyway... HA. You and Dad gave me the gardening bug. Thanks for always encouraging and for stopping by to hang out with me and even for helping me water on occasion. And a HUGE thanks to your hubby for sawing up those dropped limbs last night!!!!!!!! Wow! what a blessing that was. I'm so glad that your daughter encouraged you to start your blog! I've enjoyed it so much! Happy BLog-a-Versary! YOUR GARDEN is my dream garden. 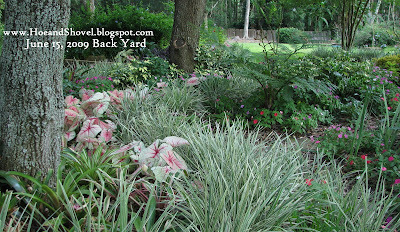 I love your raised beds and the tropical foilage behind the mini grass in your borders. WOW... wonderful!!!! Thank you Meems, for such a wonderfully interesting blog. You share your passion so well, and we truly appreciate it. It's always pure pleasure to see the garden and all God's creatures through your eyes. Wishing you a very happy 2nd blogiversary...and many more!